My nephew and one of my sisters is smoking a brisket. Her son-in-law is probably bringing BBQ rabbit (which I don't particularly care for). Now, I have to start on the important part. I'm going to try this..once anyway, tho I don't think it has enough of certain ingredients..
A copycat Blue Bell Home Made vanilla ice cream recipe. Had my most recent 3 month checkup just yesterday. Doc wants me eating more fats (I weighed 195lbs full dressed which is a continuing weight loss for me and I'm 6'4" tall...strong wind gonna blow me away) and my A1C is at 6.0, which lower than last time. I can again have ice cream. 2 are Smithfield...dunno where the other one originated, my other sister bought it. They were $.89/lb at HEB, which is a Texas based grocery chain. 2 are Smithfield...dunno where the other one originated, my sister bought one of them. I know Smithfield well and do business with them. 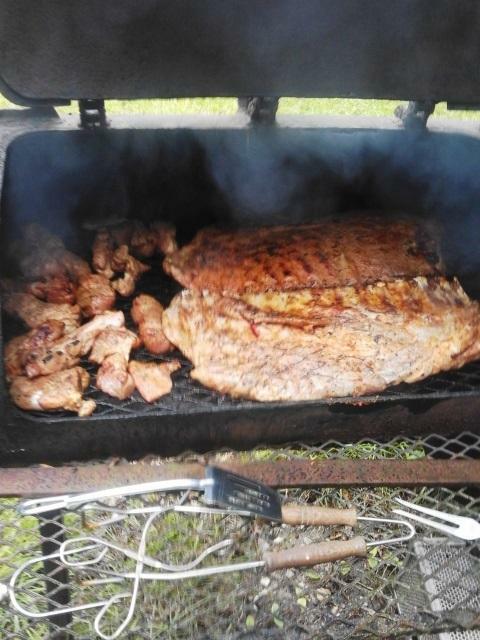 It rained all day, and since we were doing it at my sister's place and her smoker weighs about 600lbs, I couldn't move it under roof. It wasn't much fun, as #3 son and I tended to the dead animals pieces. 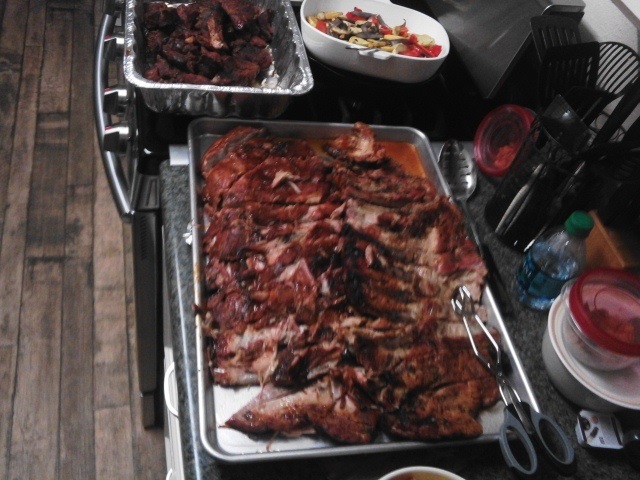 Ended up only doing 2 slabs of ribs instead of the 3 because there was a death in the extended family amnd some weren't going to be there. (my niece's 93 year old ex-father-in-law died Sunday) and I never was able to get a firm count of how many were going to be there..ended up with 16 instead of the original 23. My son..we both looked like drowned rats before it was done. There was a screw up on the sausage. I had 3 five packs of links I really like and my eldest sister had said she already had some as well, of a different kind. When I got there, as the sausage was already smoked as it came from the store, it would be the last thing on the grill. When I got there and unloaded everything, I handed m niece the sausage and told her to put it in the refrigerator. Unknown to me, the frige was chock-a-block full, so she put it in a cloth grocery bag, came back out and laid it on the table under the carport with a bunch other stuff and didn't tell me. When I went in to get it from my sister, sis told me she "had already took care of the sausage and did it in the oven". When we ate, I got one of the links, which my sis had put sticks in, and found it way more spicy than it should have been and my b-i-l said they were awful hot for that brand of link. It was only when son and I were cleaning up and putting everything away so sis could get her truck back under the carport that I found the 3 packs of sausage in that red bag. 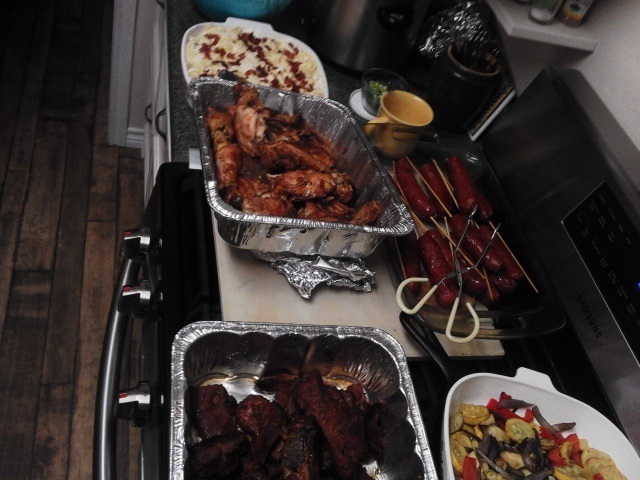 I had gone light on my seasoning of all the meat because my son has bouts with gout and one of my b-i-ls has Diverticulosis so spicy sausage was off the menu...that sausage my sister put on the skewer sticks was pretty dang hot..some she had bought. The ice cream. Worked out pretty good, tho still a far cry from Blue Bell. I did have trouble with my churn. The plastic gear at the top of the can and it's mating gear in both the hand crank and the electric unit kept jumping the teeth. A fairly expensive unit, 1 1/2 gallons and I haven't used it but a few times, but it did finally freeze and I got to use my 1947 Hamilton Beach malt mixer like you used to see at the drug store ice cream counter to make a few malted milk shakes. I did promise myself this would be the last time I tried to do this at someone else's home. Just too much trouble and too many unknowns even with getting everything ready the night before. We originally had a Plan B, which was to just put a bark on the meat on the grill right quick, but actually cook all the pork in 3 electric roasters we had there. I wish we had gone that route. I can do a full slab of ribs in an electric roaster and they really come out great. Not much fun bbqing in the rain. 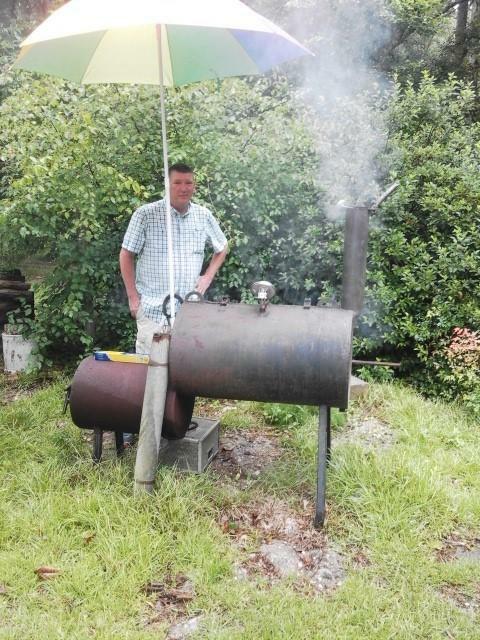 greybeard wrote: It rained all day, and since we were doing it at my sister's place and her smoker weighs about 600lbs, I couldn't move it under roof. It wasn't much fun, as #3 son and I tended to the dead animals pieces. Ended up only doing 2 slabs of ribs instead of the 3 because there was a death in the extended family amnd some weren't going to be there. (my niece's 93 year old ex-father-in-law died Sunday) and I never was able to get a firm count of how many were going to be there..ended up with 16 instead of the original 23. I'm sure the food was great though! The food looks good and a lot of work as you can see from the pictures. Probably a lot of leftovers as not as many showed up as though. Not too many leftovers, or at least not many came home with me except the ice cream. I got most of what was left and there was probably a full gallon left. 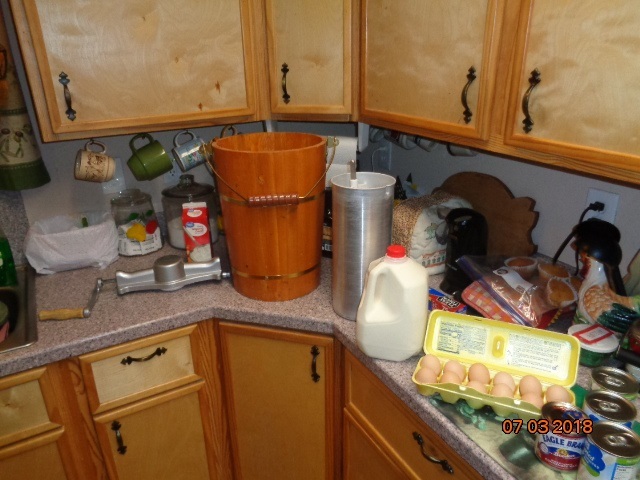 The ice cream recipe at the website I linked too is not bad at all, tho I had to increase the sugar to 3 cups, the evap milk to 3 cans and I used 8 egg yolks and I used 8 more oz cream as the recipe was for a 1 gallon churn and mine makes 6 qts. Could probably have used 10 egg yolks. I don't know how much whole milk I used..just filled it to the line after everything else was poured in. Then add cream and condensed milk and vanilla. Pour into ice cream churn. Add milk until to fill line. Pack cooler with layer of ice, then rock salt, and continue to repeat until full. It's done when it won't churn anymore. Been a staple here lately. Jogeephus wrote: Been a staple here lately. Here too. And to think I waited till I was 30 years old to start liking tomatoes. Man that’s a lot of tomatoes I missed out on. Pickled okra? Yes, pickled okra. I'm canning about a 1.5 gallons every other day. Mixing all sorts of peppers with them experimenting with the heat. Have everything from ghost peppers to cayenne peppers I'm tossing in the jars. So far nothing too hot. Its been too hot to eat regular food so I've been eating mostly things from the garden. Jogeephus wrote: I hurt myself trying to finish this and couldn't get but halfway. My dog now thinks I'm a gracious deity. Actually there are a few places for sale. Some of these boys driving the big fancy trucks are learning the hard way that deductions don't pay the bills.